[[strike-through]] day of prayer [[strike-through]] Dr. JOHN W. LEMMON OPTOMETRIST 527 SOUTH IOWA WASHINGTON, IOWA PHONE OL 3-2987 ACROSS FROM CHRISTIAN TABERNACLE Are you a non communist? Former Communist Whitaker Chambers said this about the anti Communist as compared to the non-communist. He said that the non communist will always come to terms with communism because they stand on common ground. [[underlined]] Both are materialistic, hence lacking in morality, and devoid of spiritual indignation against the ungodly. 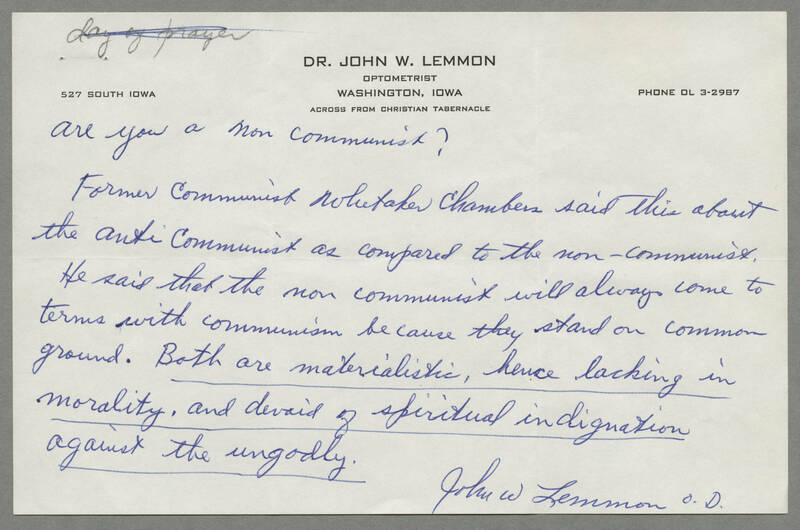 [[underlined]] John W. Lemmon O.D.